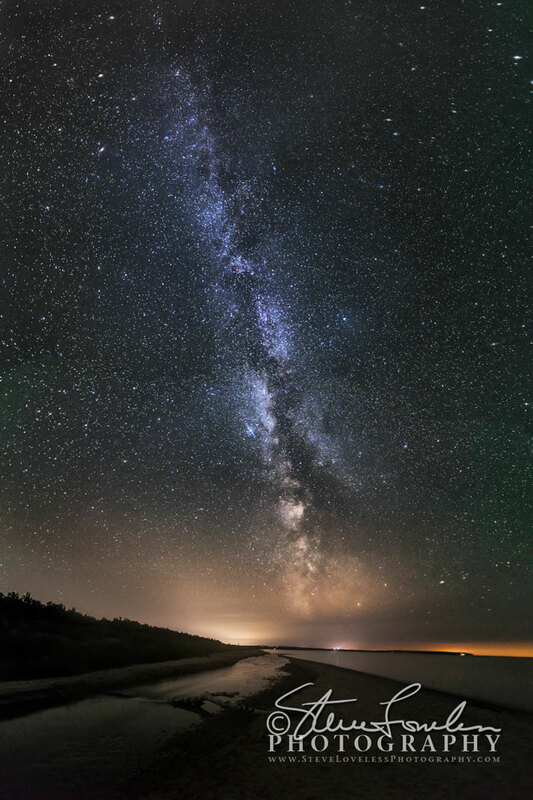 I was out with a good friend to shoot a Milky Way photo and we ended up at Otter Creek Beach where the creek empties into Platte Bay in Benzie County. This is just south of Empire, Michigan and part of the Sleeping Bear Dunes National Lakeshore looking to the south. It was a clear night with some dampness in the air which emphasized the light pollution from Beulah in the center plus Frankfort and even Green bay, Wisconsin of the right. Just another good reason for communities to change night lighting to controllable LCD fixture like Beualh is going to do. This is a 7 shot vertical stitch made with my Nikon D800e, 14-24mm f2.8 lens at 15mm, 25 sec, f2.8, ISO 1000, Manfrotto tripod and Really Right Stuff gimbal setup. Processed in ACR, stitched in Photoshop and edited in Photoshop and Nik.